It’s a big day for Facebook video marketers and a win for viewers as well. Facebook has announced a change to the way they rank video in the News Feed. This will place emphasis on video completion rates. In other words, the length of time your audience spends watching a video will impact how it shows up in the News Feed. Ready to kick your Facebook engagement up a notch? We’re sharing 101 easy ways to get your fans clicking, liking, and sharing! If you’ve spent time creating video for Facebook, you already understand the value of video rank. Once you know the signals that factor into video News Feed preference, you can begin creating content your fans actually want to see. 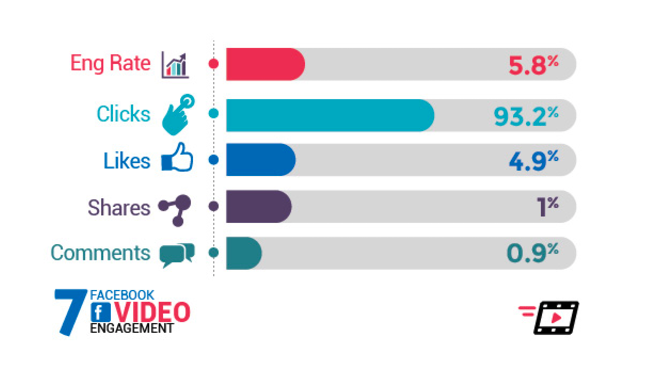 What is Facebook Video Completion Rate? Facebook’s average completion measurement details how much or what portion of a video was viewed. But how should this change your current video marketing strategy? You login to Facebook and you’re met with a barrage of videos. One is a short political spoof, one is a long video of your best friend dancing at her wedding, and the last one? A cat wiggling its entire body into a jar. But wouldn’t it be great if the right video, at the perfect length was served up to you every time? And better yet – what if your video was shown to your audience every time you posted one because of their viewer interest in the past? That’s a homerun for any Facebook marketer! And this is exactly what the latest Facebook Algorithm Update looks to accomplish. Sure, a lot has been discussed over the last year about the length of videos. Short vs. long – which perform best? But with this new focus on completion rates, you won’t have to guess. Digging into your percentage totals will help you create better content that retains viewers from beginning to end. That could be your key differentiator. Are you using video in your Facebook marketing? If not, you should and here’s why. According to a Locowise study, 47% of Facebook pages don’t upload videos. That gives you the competitive edge. The average length of a Facebook video is 55.3 seconds. The average view duration is 18.2 seconds, which means that people watch only a third of a video on average. 78.2% of all video views were autoplayed while only 21.8% of all views were clicked-to-play sound. 53.2% of all views were “30 seconds views”. 67.1% of all “30 seconds views” were autoplayed while 32.9% were clicked-to-play sound. 43.3% of all organic views were “completed” while 31.1% of all paid views were “completed”. 93.2% of all engagements were clicks. Only 4.9% were likes, while 1% were shares and 0.9% were comments. There’s no doubting the importance of video in a 2017 marketing strategy. The decision you need to make is how you’ll use it. And how this latest Facebook update will affect the type and length of video you create. What’s your take? Will you make an adjustment or maintain status quo?